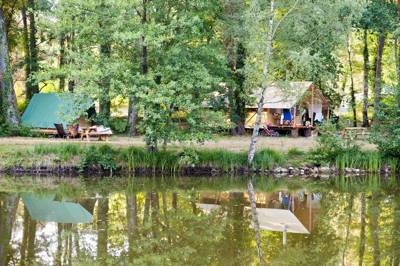 Camping amongst the trees, with a beautiful lake on your doorstep! 11 m² - 2 pers. This duo tent in canvas and wood was designed for couples who want to escape in the wilderness. A true cozy nest, you enjoy all the pleasures of sleeping under the canvas with the comfort of a good bed! Everything is ready for you to have a perfect stay. Wood Cabin for up to 6 people. 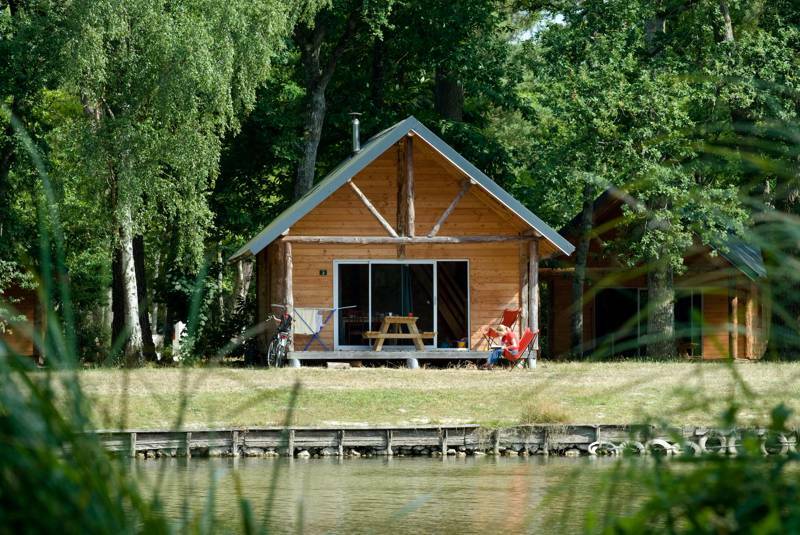 5 m² - 6 people The Huttopia Wood Cabins are made entirely of untreated wood. Perched on stilts, they are dotted about in the midst of the forest and on the shores of the lake. The ideal accommodation for families looking for nature! 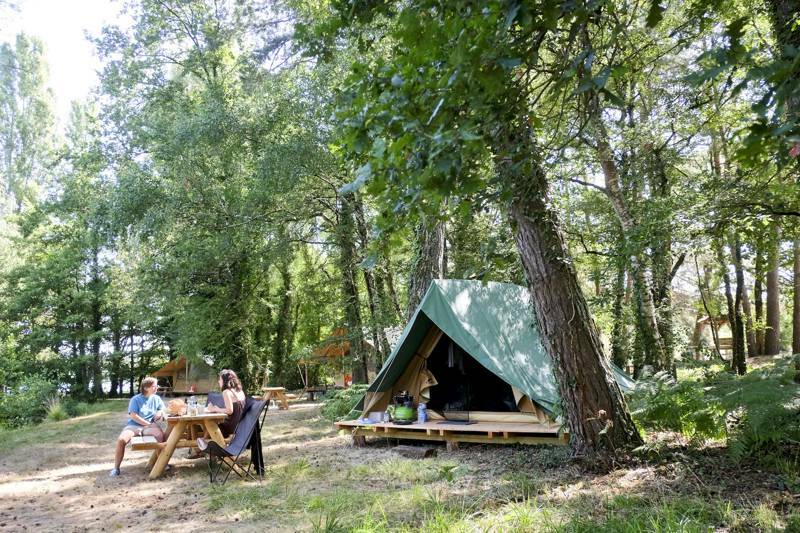 Huttopia have a simple formula across all their campsites – take a ginormous patch of natural woodland, subtly pimple it with eco-friendly camping facilities and then open the gates to any camper with an affinity for the trees. It’s formulaic in its approach but the result is anything but, after all, no two trees are alike and every setting offers something dramatically different. 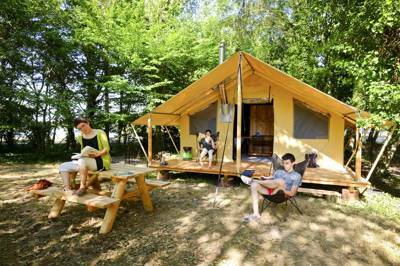 Take Huttopia Rillé, for example, the forest is almost a side-note to Étang de Pincemaille, a vast lake the campsite overlooks. It’s the surroundings that dictate the camping here. And we think that’s exactly how it should be. The pitches themselves come in various types. There are shady woodland spots, tucked beneath the Scots pines, chestnut trees and lime trees that populate the woods. Some of the most prized positions are near the two tennis courts, built where the woods open out into a clear area. 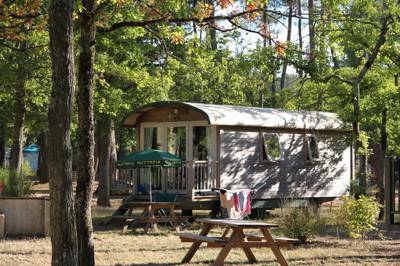 ‘Camping +’ pitches are also available – much the same but with a wooden picnic table for you to use – and then there are the glamping options, of which there are many. Unusually for Huttopia, generally dominated by families bringing their own tents, the Rillé site is almost half taken up by glamping accommodation. All of the units, however, have a focus on their eco-credentials. Built out of French Douglas fir and gradually blending into the surroundings as they age, they range from small safari-tent like structures, such as the ‘Bonaventure tent’ sleeping two, right up to larger wooden cabins and gypsy caravans, well-equipped for an entire family. If you fancy travelling light and turning up with just your swimming togs and a toothbrush you can’t go far wrong here. Water babies are in their element. If you’re not on the lake, dabbling around in pedaloes and canoes, then you’ll probably be bobbing about in the heated swimming pool which overlooks the lake, giving it a curious continuity. There’s a terrace that overlooks the swimming pool in turn, a handy place to enjoy a home cooked pizza and spread your map across the table to make a plan for the day. You could rent bikes to explore the local area, hop on the charming Rillé steam train that puffs its way around the lake or just stay put and acquisition the communal BBQ for the day. Life’s full of tough decisions. 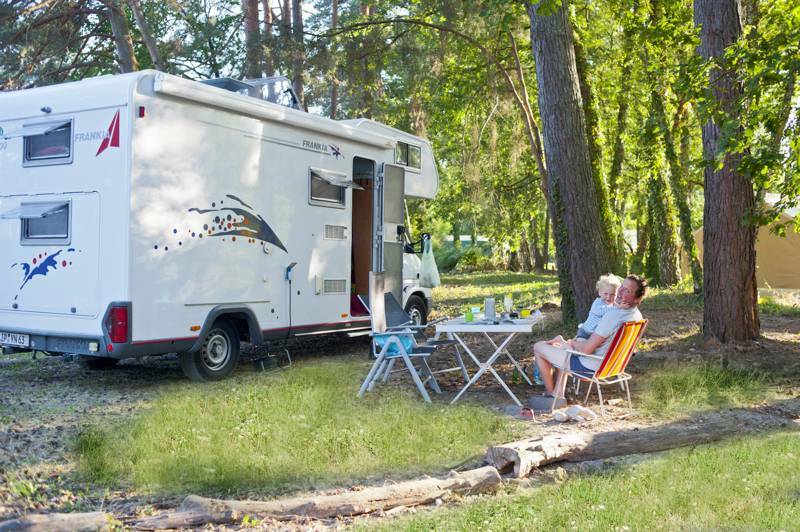 A pitch for 2 people and a tent, campervan or caravan starts from €22 per night in low season. Additional adults €5.50–€8.90; children under 4 years old free, and children between 4–10 years are free in low season and €5.50- € 6.70 in high season. Pets €3–€5.00. Glamping accommodation begins from €50 per night and range right the way up to the largest cabanes (for up to 6 people) which peak at €172 per night in high season.